Peacehaven boss Tony Coade has bolstered his attacking options in time for their crunch derby clash against Lewes. Bayan Fenwick, 22, was released from Crystal Palace and trained with Peacehaven this week. Coade was impressed with the former Lewes and Eastbourne Borough striker and acted swiftly to sign him up in time for their Ryman League Premier derby clash with Garry Wilson’s Lewes outfit. Coade said, “We have been missing a player like Bayan. He has that little bit of quality with an eye for a goal. “Last week we dominated against Harrow Borough but we just couldn’t put the ball into the net. Hopefully Bayan will help us in that area. It’s a real boost for us. 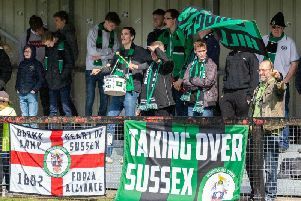 Coade added, “Lewes is a huge game for us. It means a lot as they are our near neighbours, we are close in the league and it means a lot to the club. Tom Lawley is pushing for a first team start having recovered from an Achilles problem. Peacehaven are 16th in the table and need a win to boost a poor run of form that has seen them win just once and lose four of their last five matches. Lewes have also been on the slide lately and have dropped to 19th in the Ryman League Premier following back-to-back defeats against Hendon and Canvey Island. Boss Garry Wilson said, “Derby games are always a good occasion and it’s a match we are all looking forward to. Our performances have been much better of late there is no doubt about that but we need to turn those performances into wins. Lewes skipper Gary Elphick (hamstring) and goalkeeper Rikki Banks are doubtful.